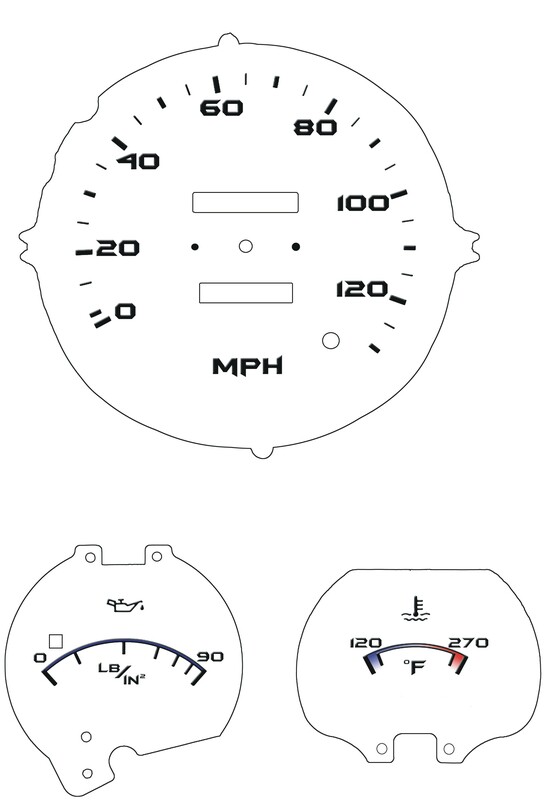 I spent a lot of time on the internet to find anyone that had white face gauges for the 280zx, I found a lot of links for the early generations, 240 to 280z, but nothing for the ZX or even any generation of the 300. 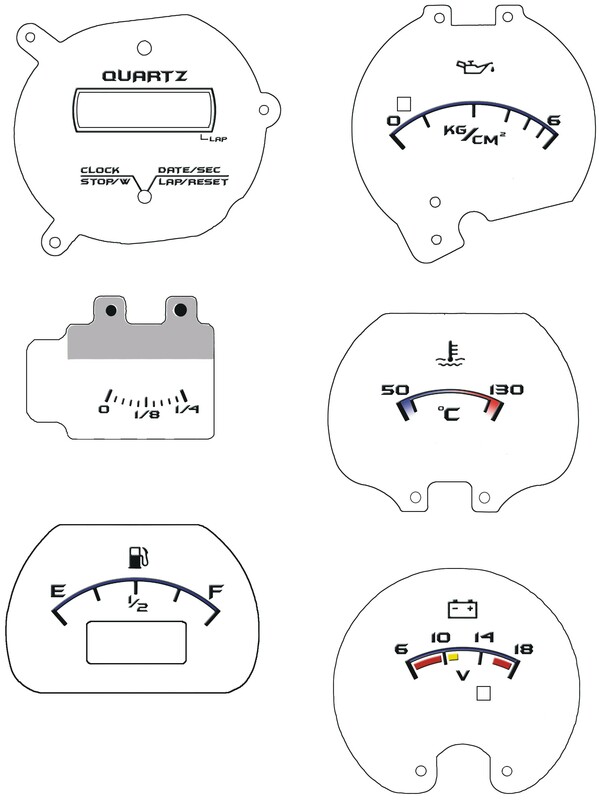 I did talk to a guy from Australia who did make some for his 280zx, he gladly sent them on CD for me to use, the only problem I ran into was that he was missing the clock and the small fuel gauge labels. So I scanned my own gauges and made my own white face gauges with different fonts and clear cut out lines for them. 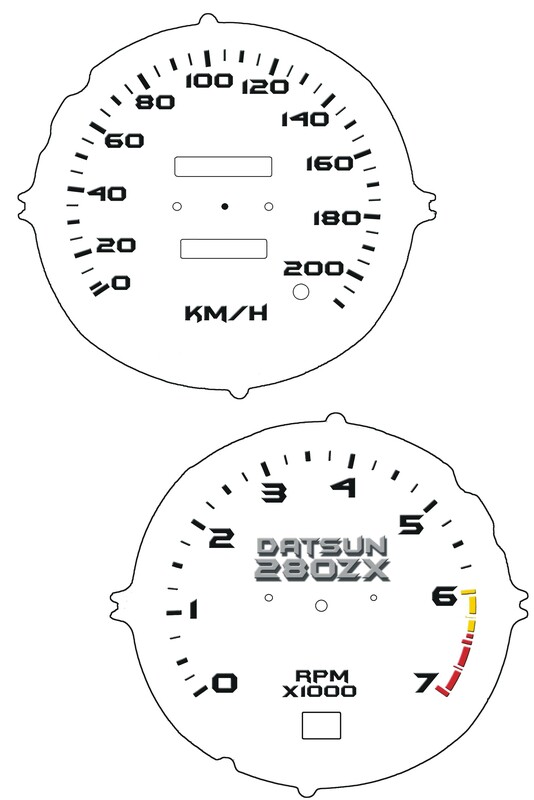 The 280zx gauges are easy to do and all you have to do is print the gauges on a white full page label, cut em out and stick em to you stock gauges. Including the time to put stickers on faces you should allow yourself at least 7 hours to complete this, given you don’t have problems. Take your time and keep your hands clean when handling the white gauges, they will probably get dirty very easily and you would have to re-print a new sticker for it. Tools: 12mm socket and extension for steering column, 1 long Philips screwdriver, 1 regular size Philips screwdriver, 1 stubby Philips screwdriver, 1 small flat head screwdriver, 1 90 degree Philips screwdriver and a tiny Philips head screwdriver for the gauges. Lighting: I changed the factory orange lights to blue at the same time, you will have easy access to the lights and if you are going to change the color do it now. I like the blue but find it a lot dimmer and harder to see the speedo and tach at night, red would look cool or any other color you can find. You will need 8 bulbs, 5 for speedo head and 3 for center instrument cluster. Gauge needles: you may want to paint the needles for better contrast to the white compared to the stock color . Use a couple light coats of primer and then the color of your choice. DISCONNECT YOUR BATTERY - This will prevent any sparks, shorts or feedback to your guages as you disconnect and re-connect the wiring, there are live wires there even when your car is turned off. - push out the small white plastic wire holder on the dash frame, it is holding a group of wires that will get in the way when trying to remove the cluster. - Unscrew the single screw holding cluster in dash. - Pull out cluster from dash. 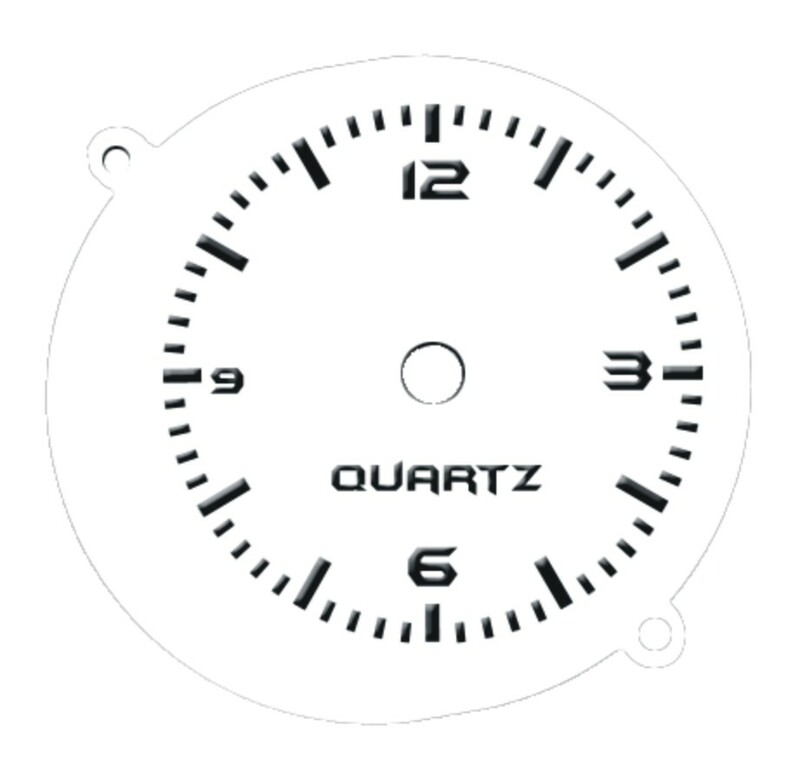 - Disassemble cluster to get access to the gauge faces. - DO NOT REMOVE THE NEEDLES, it will make it very difficult to re-calibrate them in the right position if you do. - For the oil pressure face you can pull off the gauge face, put on sticker you printed and then replace on gauge. - For the voltmeter you should be able to do the same. - re-assemble cluster and mount back into dash. - Remove steering column cover, top and bottom piece. Remove the light and hazard assemblies from the covers so you can set the covers aside for now. - Remove the 2 bolts holding steering column to frame. This will allow you to push it down just enough to wiggle the instrument cluster out of the dash without removing the steering wheel. - Disconnect speedometer cable up by the top of the accelerator pedal and fire wall. - Remove the trim screws around the cluster ( under the top lip ), wiggle the cluster out of dash enough so that the colored trim is out of the dash, you will need to then remove that trim from the cluster using the 90 degree Phillips on the outer screws, the stubby on the bottom inside left screw and the long one for the bottom inside right screw ( getting the stubby one up by the ignition switch is a pain ), then unclip the 2 clips on the top and then remove. - Pull the cluster further out of dash again, enough to reach in and disconnect the speedometer cable from head ( easier that way ), and the 3 wire harnesses. You can now pull it completely out of dash easily with the steering column loose. - Disassemble the cluster to access the gauges. - Tach: carefully note the location of the needle and then remove, use a pliers and pull straight out from center of needle. They are very week plastic and break very easily ( trust me, I did it ). There is a small metal pin that mounts the plastic needle to the gauge shaft, that should come off too ( if you cannot get that piece off then you will have to maneuver the sticker onto the gauge while mounted. ). If it did come off, then remove the face, put on sticker and replace. Be careful to get the needle back into the original position. - Speedometer: this is the trickiest ( was for me at least ). 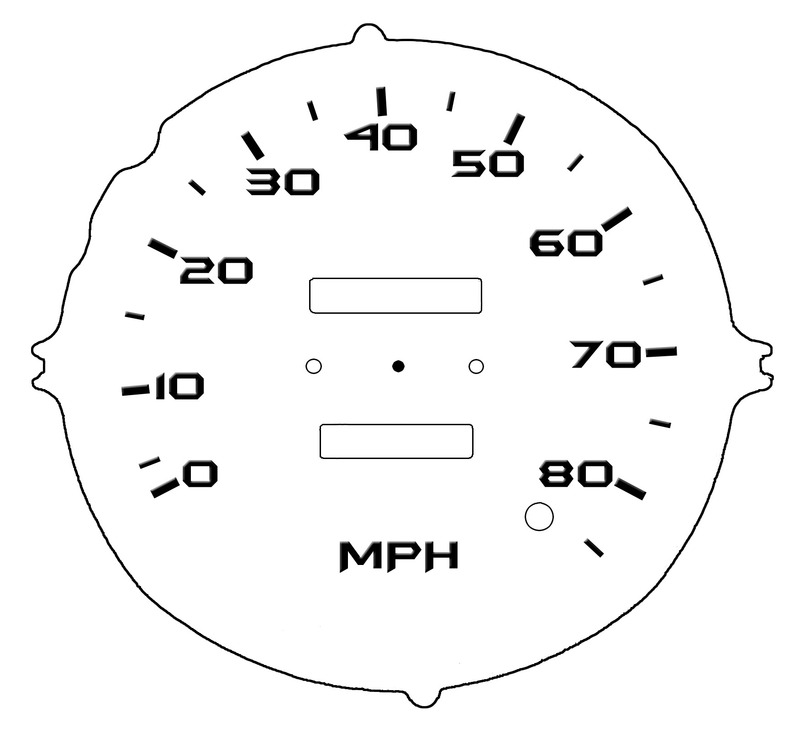 First remove the entire speedometer from the cluster ( 2 screws on the back side ), remove the stopper at the 0 if you have one before you remove the needle. Make note of the resting location of the needle and if you have the gauge flat or vertical ( that makes a difference ). Then remove the needle like the tach needle. The same little metal piece the tach had may or may not come off the speedo, it didn’t for me so I had to maneuver the sticker on around that piece. Do not try to force it off, you may damage the shaft that connects to the gauge. Once you have the sticker on, re-assemble gauge and put back into cluster. - You can now put it back together and then put back into dash like you took it out in the first place. Here are some before and after shoots of them installed. before and after shot of center guages. More pictures on the way - before, after, during, full sheets of the printed labels, sanded faces, etc.